Dosas are the new pizzas! Americans are acquiring an insatiable appetite for those lacy crepes from the south of India and dosa joints are popping up all over. Along with the traditional dosas, savvy entrepreneurs are introducing new flavors for a new audience. One of the dosa-pioneers in Long Island is Jay Jeyasri, whose House of Dosas sees a steady stream of Americans asking for – Gunpowder Masala Dosa! After this volatile concoction was written about in a local review, Jeyasri has experienced a huge demand for it. “Americans now eat more spicy than us,” he says. “They take out tissues and are sweating, but they finish it and they love it! We even have Koreans who want it very spicy.” Other favorites with the non Indian customers are the Spinach Masala Dosa and the Paneer Dosa, while kids love the Cheese Dosa, a triangle filled with Amul cheese. The Cheese Masala is a blend of cheese, onions and potatoes. For the truly adventurous or the geographically confused, Jeyasri even has a Chinese Dosa, which is filled with vegetable noodles and sliced into four pieces. Actually, an non Indian couple, Gary & Isabel MacGurn latched on to the versatility of the dosa in 1997 when they started Hampton Chutney Co. in Long Island, introducing such offbeat fillings as Grilled Portobello Mushrooms, Balsamic Roasted Onions, Spinach and Goat Cheese and Avocado, Fresh Tomato, Arugula and Jack Cheese. There’s even a Breakfast Dosa with eggs, spinach, roasted tomato, cheese and avocado. Hampton Chutney has a very popular location in Soho and a new one is opening uptown. There are dosa places in every state with an Indian population, from Atlanta to Los Angeles, and all seem to be thriving. Lexington Avenue in Manhattan alone boasts at least a dozen dosa places, the latest being an import from Chennai. Saravanaas is a franchise of Saravana Bhavan, a well-known chain there, and the chefs have been flown in from India. It serves the traditional classics, like dried fruit rava dosa and ghee idlis, in a modern décor. Its special novelty – as in India – is the six-foot long family dosa that is now available in its restaurants on both coasts. So how does one cook a six-foot dosa? On a seven foot grill! And how do you serve this dosa, which is taller than most Indians? On three plates! 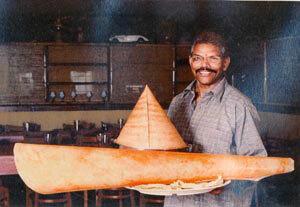 In Atlanta Madras Saravana Bhavan claims to have created 7 foot, 12 foot and 20 foot dosas for special events. And now you also have a traveling dosa salesman! Thiru Kumar has become almost a cult hero for the dosas that he provides to New York’s Village community from his dosa cart. 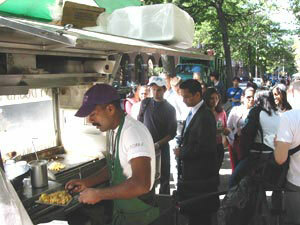 He is always parked at Washington Square Park and the dosa cart is a huge hit, especially with the New York University crowd. Kumar gets up at 5.45 in the morning and gets fresh food ready in his kitchen facilities in Queens. By 11 he’s at the cart and has people queuing up for his reasonably priced treats right up till 4 pm. His Jaffna dosas cost just $1 and are an intriguing mix of black lentil, red raw rice and natural herbs. How many dosas does he make in a day? That depends on the weather. He’s one chef who always checks the weather forecast before he cooks; if it’s going to rain, his stove won’t be quite as hot. Still, he averages over 250 people daily, and by 4 pm his cart is empty. Kumar says he had tried many other professions earlier, but has found his true calling with the dosa cart. He came to America from Sri Lanka through the Green Card lottery, but now seems to have hit a dosa lottery! For those who want their dosas dipped in spirituality, the place to go to is the Ganesh Canteen in the basement of the Hindu Temple Society in Flushing, where the dosas, idlis and other South Indian delicacies. are prepared by volunteers and the profits benefit the temple. Divine Dosas, you might say!